10 Should Mondophrenetic™ be preserved? In its ideal state, Mondophrenetic™ is installed in two separate rooms. 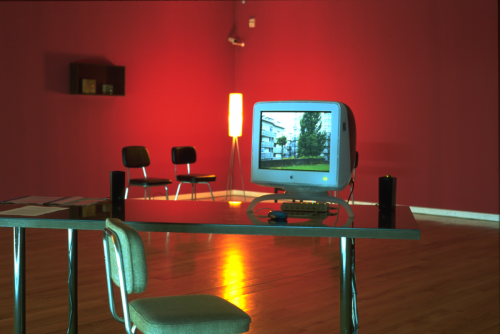 In the first room where the visitor enters the installation space, a computer monitor, a computer mouse and speakers are installed on a table. Designer chairs, floor lamps, a coffee table and (often) a vase with flowers give the visitor the impression of being in a lounge room. Being in this first room feels at the same time both cosy and alienating. The exhibition visitor sitting at the table can watch the monitor and interact with the work by using the computer mouse (clicking and dragging). In front of him/her, a random series of colour photographs of buildings and residential blocks are displayed at a slow pace, sometimes interspersed by monochrome colour screens with short texts that seem to be extracts from a diary, statistical information or short excerpts of Jean-Luc Godard’s film Deux ou trois choses que je sais d’elle. From time to time a cursor appears on the screen. At that moment the exhibition visitor can click to change the course of the work. Music and soundscapes accompany the images and sequences. The soundtrack creates atmospheres that are suggestive of buildings as living organisms, creatures with nervous systems. It is a kind of ‘easy listening’ or ethereal mix that is detached from any recognisable source, and is sometimes briefly interrupted by sound glitches. In this lounge room the exhibition visitor can also consult documents related to the Mondophrenetic™ installation: a text by the artists on their work, a user’s manual, some biographical information on the artists, press reviews, etc. From this first room the visitor can walk into a second one (almost always adjacent). In this darkened room a large screen projection mirrors what is happening on the computer monitor of the first room. Large foam seats allow visitors to sit back, watch the projection and listen to the soundtrack. The projection in this second space mirrors in real time what the exhibition visitor / user is watching on the computer monitor and is doing with the computer mouse, except for one detail: the exhibition visitor can only see the cursor on the computer monitor, not on the projection screen. The visitor's experiences in the two rooms are meant to be completely different. In the second space the sound is louder and the room darker than in the first one. In the first room the exhibition visitor can interact with what he/she is seeing and hearing by moving and clicking the computer mouse, in the second room he is a passive viewer. 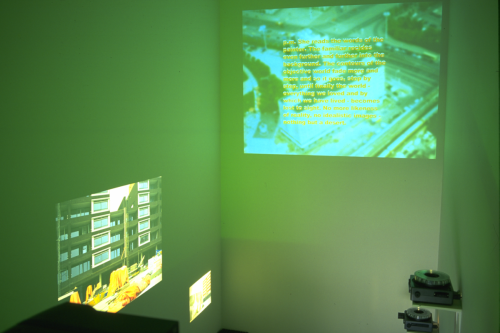 While watching the computer monitor is more like a home or office experience, watching the projection is closer to a cinema experience. 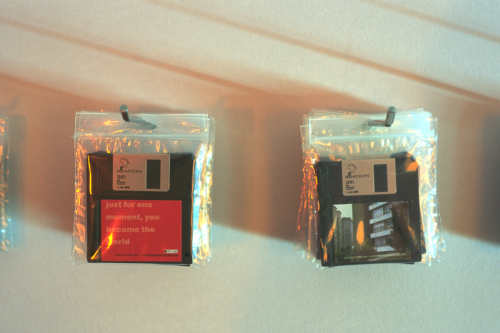 Floppy disks (or in a later version CD-ROMs) containing a screensaver are hung against one of the walls of the first room and the exhibition visitors are invited to take one home when they leave the exhibition. When this screensaver is installed on a computer at home or at work, a part of Mondophrenetic™ lives on outside its original exhibition context. “On entering the room you find yourself in an utterly different place. On a desk, there is a regular PC with images and text. The photographs show huge apartment blocks in the outskirts of big cities, anonymous places, where people live and work. An efficient and straight-lined architecture, built en masse, created by builders and real estate developers rather than architects. The great blocks have been photographed from a distance. In the large series of images (over 500 photos) one can hardly see any passers-by, it is as if the world were empty. The order of the pictures seems arbitrary, but is in fact guided by computer software carefully designed not to convey any sense of direction. Using the mouse, anyone can find his/her own way through the material, but there is no map. And, as opposed to clear (predictable?) navigation through a CD-ROM or web-page, here there is no way back, there is no back or home, no new beginning. You keep on searching for clues to a possible orientation, and the feeling you get is not unpleasant at all. Day and night images follow one another, flow ad infinitum. All these concrete blocks look alike. One moment you seem to be in Brussels, New York, Beijing, Helsinki, La Coruña, Paris, Sarajevo, Bombay, and the next you are back in no man's land again, any suburb on the periphery anywhere in the world, anywhere and nowhere. The ever-growing flow of images is regularly interspersed with texts. They are fragments of a fictional journal. They tell their tale about distant galaxies, about thinking of your lover while he/she is out. Tales of billions of years gone-by, about waiting on the platform at central station, about the taste of vanilla flavored salve on your lips, about products and trademarks around us, about the moment that you become the world and the world becomes you... Brief notes, consciously playing with and mixing the concepts of alienation and engagement, of public and private. They could have been written by the anonymous woman (she) or the anonymous man (he) who wander through the nonexistent narrative. Perhaps, there are several men and women. What is clear is that it is impossible to find out where they took their notes, for in these times of faxes, modem, gsm and other means of communication which have lessened the importance of geography, time is more important than place. And it is equally clear that their individual views are confronted with the 'objective' data and statistics that surround us in the society of information. So it is with this multimedia installation where population growth rates, and figures of tourism, and multinational companies can tell everything and nothing at the same time. The installation soundtrack is made to measure. The three artists asked the musician and composer David Toop to write music that is as tangible as audible, and to make sure that the highly technological music sounds very natural. He had to have in mind as well that this music could not have a linear order. The composer of a soundtrack for a multimedia installation must know that he will sooner or later lose control over it: its creators and the computer engineer, in the first place and eventually the user, determine in turn how the music is going to be used. This is no exception;, some musical fragments get mixed and overlap in inexplicable ways;, with a single mouse click you can (without even noticing) cut them beforehand and make them start again. This ambient soundscape does not work as a regular music theme, but it does not lend itself to be classified background music either. Making use of familiar concrete sounds such as cell-phone and modem sounds, the composer creates various environments which on the whole evoke a building with a central nervous system, a building as a living organism. This is presently the music of tomorrow, music that evokes globalization, somekind of purpose-made easy listening suited forthe transnational flux in which all the cultures of the world become absorbed. After experiencing usage you move on to experiencing seeing (the other way round is fine as well). A film is being projected in the adjoining room. Or not exactly, image and sound seem to be glued as if in an actual setup, but they are not. The large-screen projection shows what is happening on the computer screen close-by. On the large screen, however, there is no disturbing mouse so that you don't seem to be looking over somebody's shoulder, here the work seems to live its own life. It is a film, with no beginning and no end: combinations of image, word and sound are constantly changing. Those who want to take experience them all, will have to stay for more than two hours. Even then, it is impossible to come up with the same combination twice. The computer chooses at random among the stored photographs, texts, and music, with a little help from the creators and the computer engineer. The original idea behind Mondophrenetic™ emerged from a previous work by Els Opsomer, Desire/at last, made in 1997. 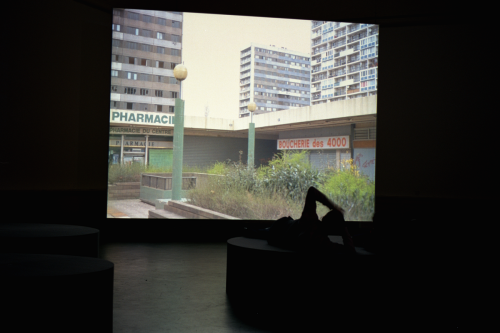 This work consists of the projection of about three hundred colour slides that were shot in various cities, each portraying 'un grand ensemble', a large block of flats on the outskirts of a city. After the creation of Desire/at last, Els Opsomer wanted to make a CD-ROM project with her photographic images, and Herman Asselberghs, whom at the time was known as a critic, proposed to link them to Jean-Luc Godard's film, Deux ou trois choses que je sais d’elle, which takes as its setting one of the great ensembles of the suburban areas of Paris. Together they invited Rony Vissers who had been working as a producer of video and film artworks2 to join them. While they kept the original idea of interactivity and non-linearity they soon decided to create Mondophrenetic™ as a multimedia installation instead of a CD-ROM. “First came the slide installation 'desire/at last'. This consisted of the projection of about three hundred colour slides shot between 1995 and 1997 in various cities [including Beijing, Berlin, Brussels, New York, Copenhagen, Amsterdam, Budapest, Istanbul and Prague] on three continents [Europe, Asia and North America]. Each photo is a portrait of 'un grand ensemble', a large block of flats on the outskirts of the city: the everyday setting for equally everyday activities which are immensely similar all over the world but at the same time could not be more thoroughly different. This is a global catalogue of the banal, in which alien and familiar constantly change place. A catalogue of abstract architectural exercises and urbanisation plans which as a whole evokes a well-nigh endless collection of actual stories that tell us about the building and its residents, and about the city and our transnational age. Then came the multimedia installation project. The slide presentation was intended to emphasise the transient nature of viewing and reinforce the impression of disorientation. The multimedia installation naturally lends itself even more to the evocation of this ambiguous and simultaneous feeling of displacement and security. In a single photo a block of flats seems to be everywhere and nowhere [in many cases it is impossible without prior knowledge to distinguish between photos from, for example, Prague and Brussels], but in the rhythmic succession and repetition of a large number of digitalised images this confusion [or is it an invocation?] can be boosted even more. On a disk and as part of the installation, the photo is no longer of importance as an artefact [if they were it would be better to frame them and hang them on the wall of a gallery to be looked at one by one], rather the accumulation of apparently banal images that continually delay their definitive interpretation. Furthermore, the multimedia installation offers the advantage of showing the images in a different order each time one looks, so that the sequence not only invites one to look again and receive new impressions, but also provides another view of the same material. During the production process of the installation two other works linked to Mondophrenetic™ in different ways were exhibited: Slightly bemused by this lack of orientation (1998) and Wanting to become part of the environment (2000). Slightly Bemused By This Lack Of Orientation was exhibited as part of the group exhibition Onzichtbare Stad / The Invisible City at Centrum voor Beeldende Kunst Marres in Maastricht from September until October 1998. While it was a different installation using photos that are part of Els Opsomer's general work, it is mentioned here (and was also mentioned on the website of the project) because it contained a lot of ideas that would be further developed with Mondophrenetic™. However, while the concept had a lot of similarities with that of Mondophrenetic™, the equipment used, the application's behaviour and the installation parameters were all very different. The computer was an Apple Power PC G3 (probably a 450Mhz / minimum 256 MB RAM / 20GB HD) - less powerful than the Power PC G4 used later to show Mondophrenetic™. The monitor was from the same generation as the computer, and had a very classical design compared to the Apple Trinitron type CRTs used in Mondophrenetic™. The software part of this work was also made with Director, but the functionality and behaviour of the application were very different from the one developed later by Andreas Kratky for Mondophrenetic™. Slightly bemused by this lack of orientation had a more classic interface and type of navigation that were closer to those of a web page or a CD-ROM. It consisted of a mosaic of thumbnails on which the user could click to see the different pictures and materials used in the work. Although Slightly Bemused by this lack of Orientation is a work in itself, it also served as a test for the artists who then decided that they wanted a different type of user experience for Mondophrenetic™. They didn't want the audience to be able to just go through the material in a couple of minutes by clicking on the next picture or video until they'd reached the end. They wanted the visitor to spend time in the exhibition and to adapt his/her visit to the pace of the work. 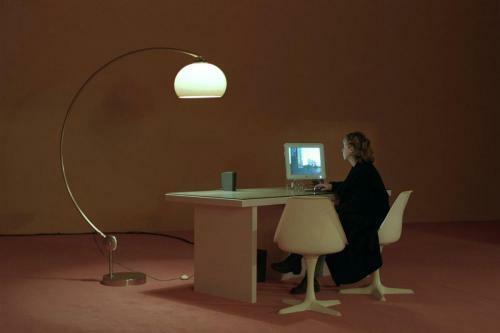 For the artists, it is important that the visitor enters the exhibition of the Mondophrenetic™ installation through the room in which the computer is installed. The visitor should discover him/herself that there is a connection between the image on the computer monitor and the large image on the projection screen, and more specifically that the projection is controlled by the exhibition visitor / personusing the computer mouse in the first room. 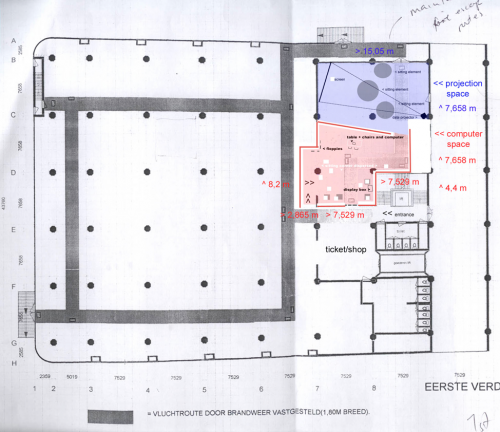 Although it wasn't mentioned in the technical rider section of the website, ideally the artists would prefer that the exhibition space(s) has a connection with the outside world, for example in the form of a (if necessary darkened) window, such as in the exhibitions in Brussels and Hasselt. This opening was important to link the urban landscapes that the audience could see in the work with the context of the city in which the work was shown. However, of the eight different exhibition spaces in which Mondophrenetic™ has been shown, only those in Brussels and Hasselt had a large window in the exhibition space. 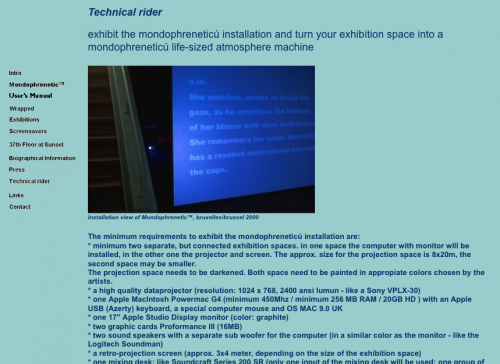 The information available in the technical rider section of the website about the lightning of the exhibition space reads: "The projection space needs to be darkened." The light level is an important element for the creation of two different atmospheres in the exhibition rooms. When the first space has a connection with the outside, daylight is present in the room, and most of the time, the lounge area or the computer area also includes a floor lamp as part of the furniture. No specific instructions are available concerning the light levels in that first space, but based on photographs it appears to be luminous, which makes sense as the lounge area is also meant for people to be able to consult the documentation present on the work. The second space, on the contrary, has no additional lighting in order to create a cinema experience. Moreover, the darkness in the projection space makes it easier to obtain a good projected image. In the first exhibition space, there's a table on which the computer monitor is installed, with one or two designer chairs for the exhibition visitors. These chairs, the floor lamps, a coffee table and (often) a vase with flowers gives the visitor the impression of being in a lounge room. - table top BRA 194 x 80 x 4 cm (IKEA). In the projection room, several foam rubber elements with circular or rectangular shapes were installed as seats. The colour of the foam rubber elements was either white, light yellow or light grey. A rear-projection screen wasn't used for every Mondophrenetic™ exhibitions. In some cases, a frontal projection screen was used instead. The size of the screen was adapted to the size of the projection space and always fitted the 4:3 aspect ratio of the projection. - two sub woofers: like Martin audio BSX sub 1.2 Kw RMS power on 4 ohm. With the exception of the two sound speakers with a separate sub woofer for the computer, the specific audio equipment listed was only used for the Mondophrenetic™ exhibitions in Brussels and Hasselt. There is no detailed information available concerning the audio equipment used for the other exhibitions. The screensavers were distributed in the exhibition space on 3 1⁄2" floppy disks, until the exhibition in Rotterdam (March 14 - April 21, 2003) where they were then distributed on CD-ROMs. Although these screensavers were also available for downloading on the website www.mondophrenetic.com, the floppy disks (and later the CD-ROMs) were important for the artists as artefacts. They were little gadgets that would help to bridge the gap between the exhibition space and the outside world. As material objects the floppy disks (and later the CD-ROMs) also had an aesthetic value. The artists designed the labels themselves, and distributed the floppy disks and CD-ROMs in little transparent plastic bags or sleeves. In 2003, the floppy disks were replaced by CD-ROMs for the exhibition in Rotterdam because floppy disks had become obsolete by that time, not only for MAC but also for PC. For the last exhibition that took place in Antwerp, no screensavers were distributed at all. According to Rony Vissers, the main reason was the lack of time and budget to produce CD-ROMs. It seems that there was no mention in the exhibition space either that you could download the screensavers from the website. The Mondophrenetic™ application was created using Director 8 by Andreas Kratky, a German developer who at that time worked at the ZKM - Zentrum für Kunst und Medientechnologie in Karlsruhe. He was contacted to design an application that, as further described in the text, had no beginning or end. The application goes on continuously, but is not a loop either as the sequence displayed is always different. By avoiding the use of any actual interface and by limiting user's control on the course of the work, Mondophrenetic™ was meant to offer an almost infinite number of unique experiences to the visitor. To produce the application for Mondophrenetic™, Andreas Kratky used the freshly released version 8 of Director for Apple Mac OS 9 operating systems. The Mondophrenetic™ application was created to run exclusively on Mac OS 9, and no version was ever produced for Windows operating systems. A cross-platform application wasn't needed because Mondophrenetic™ was to be shown with Apple hardware only. Moreover, it wasn't until Director MX 2004 that the licence for one platform allowed one to make applications for both Microsoft Windows and Apple operating systems. Director is a software designed for the creation of CD-ROM applications, but also internet interfaces and animations through the use of the Shockwave format. Director can also be used to make all kinds of multimedia projects such as interactive terminals in museums, applications using Midi interfaces, etc. Its development started in 1985 when it wasn't yet called Director, but VideoWorks. At that time this product was developed by Macromind, an Apple Software company that became MacroMind-Paracomp in 1991 after its merge with Paracomp, and then Macromedia in 1992 after a further merge with Authorware, inc. The name was changed from VideoWorks II to Director, which was published in 1987. Macromedia developed several versions of Director and John H. Thompson, an employee of Macromind, created the Lingo programming language that replaced the Basic based language used until then. Macromedia was a successful company that published popular software for web developers such as Flash and Dreamweaver and which created the SWF format and the FLV container file format that is widely used for video streaming on the web. In April 2005 Macromedia was acquired by Adobe Systems, its major competitor, and Macromedia Director became Adobe Director. The latest version to date is Adobe Director 11.5.8, released on September 6, 2010. The behaviour of Mondophrenetic™ is mainly based on seemingly random procedures so that the visitor’s experience is never the same twice. The endless possibilities of combinations reinforce the feeling of disorientation created by the images, the text and the soundtrack. Although the exhibition visitor/user has some control over the work when manipulating the computer mouse, he/she is never able to know what will happen next when he clicks. However, the work does not rely on a totally arbitrary randomness, as the artists have defined a number of rules. What is displayed on the computer monitor and the projection screen is in fact composed of several groups of photographic images. The programme itself does not only pick the group of images, but also makes a selection of the images within the group and puts them together in a random order with seemingly random time intervals. In between these images the application intersperses text screens and colour backgrounds that have been selected in a similar way. The soundtrack that goes with the images is also picked at random from a selection of more than fifty audio files (music, soundscapes, glitches and other sound effects) and mixed together. The display of the images combined with the soundtrack functions as a slideshow. "There are several different approaches to randomness in the application. For the choice of the next sequence or audio tracks we use a combination of pre-assigned groups of sequences that can be triggered in certain situations/states of the application. Among those pre-assigned choices we use a random-no-repeat selection that makes sure that before one sequence is repeated all other possibilities have been exhausted. For the colour cycles we use a "drunken-walk" that randomly traverses a color-space. Timing variabilities are realized with simple randomized values within pre-set ranges. The same is done for the disturbances. The randomization routines are in different locations and contexts in the code, but easily visible. […] It is intentionally designed so that it does not become obvious that certain functions are done at random, which is achieved through delay cycles, the "drunken-walk" and similar strategies." (Email exchanges with Andreas Kratky, 2012). At certain moments a cursor appears on the computer. This appearance is an invitation for the exhibition visitor/user to click the mouse. If she/he clicks the mouse, the slideshow stops and dissolves at random into another one with a selection of another group of images and text screens. If the exhibition visitor/user does not click when the cursor appears, the slideshow goes on until it has shown all selected images and texts and reached its end, automatically dissolvings into a kind of transition. These transitions are transforming monochrome colour screens (like a screensaver), panoramic excerpts from Jean-Luc Godard's film Deux ou trois choses que je sais d’elle or similar panoramas in QuicktimeVR that were created by the artists themselves. The exhibition visitor/user can also stop these transitions by clicking the computer mouse. The transitions then seemingly at random dissolve into the next slideshow. If the user does not click, the transitions automatically stop after a while and dissolve at random into another slideshow. The cursor appears at random, with different time intervals and in different parts of the image. In the panoramas the exhibition visitor/user can zoom in and out and move up, down, left and right. Clicking is only possible when the cursor appears, and the exhibition visitor/user never knows in advance when this will happen. This seemingly random appearance of the cursor is a way of avoiding that the exhibition visitor/user constantly click the computer mouse and navigate through the entire work as if through a simple CD-ROM. The artists wanted to slow down such clicking . They wanted the visitor to stay and take time to experience the installation as an attempt to stretch the time, in contradiction with the frenetic pace of the world pictured in the work. "It was a very frenetic world and Mondophrenetic™ always had a contemplative flow that slowed down. I was and am still very attached to that. Visiting Mondophrenetic™ was like stretching time." (Interview with Els Opsomer, Brussels, September 5, 2011). 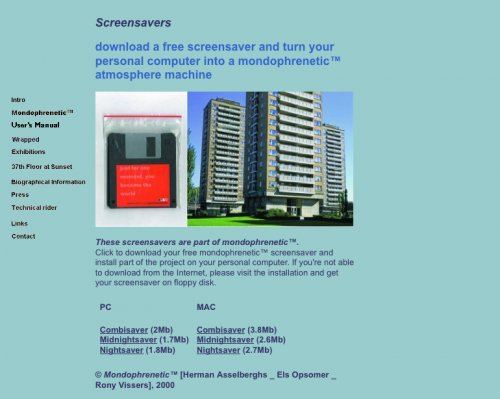 The Mondophrenetic™ screensavers came in two versions, one for Mac OS 9 and one for Windows. They were available in the exhibition on floppy disks (and later on CD-ROMs) and on the website www.mondophrenetic.com for both Mac and Windows users. The screensavers were also created by Andreas Kratky. They were Director projects compiled into platform-specific standalone applications called 'projectors' for Mac OS and Windows. For the Mac OS version, Andreas Kratky then used Auto Launch Pro. 1.0.9, a screen saver engine edited by St. Clair Software Utilities for Mac OS platforms. For Windows platforms the screensavers were made using a programme called ScreenSaverWizard 1.1 by a software editor at the time called Score Multimedia (now Score Solutions RG). The starting point for the screensavers was a Macromedia Director project that realized a very slow pan of a panoramic image consisting of two parts. Three different versions of the screensavers were created on the same principle but using different images. 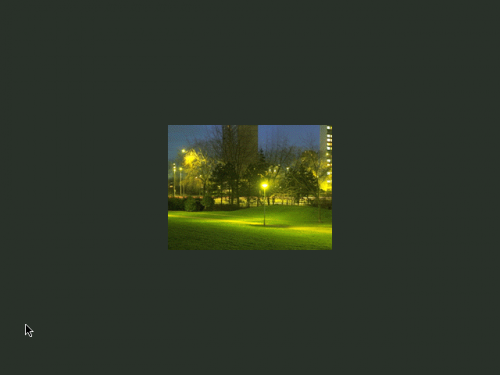 The ‘Midnightsaver’ and ‘Nightsaver’ screensavers start with a fade-in from black into the image and once the image has fully emerged, the viewpoint moves along a full 360 ° panoramic from left to right. Each time the screensaver launches, a new panoramic emerges. As can be seen in the following screenshots, the pictures of Midnightsaver and Nightsaver were taken at different moments of the day with different ambient light. The ‘Combisaver’ is different from the two latter screensavers. 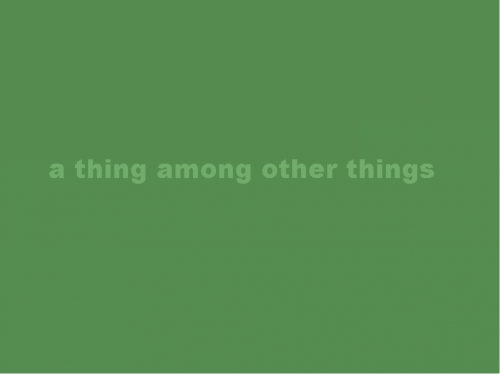 It has two options: a flickering monochrome colour screen on which the text ‘a thing among other things’ slowly appears in a slightly brighter tint and a picture of high-rise buildings on a dark background (a similar design to the Midnightsaver and Nightsaver, but without the panoramic aspect). The computer randomly selects the option and alternates them. three audio files corresponding to the three video excerpts from Godard's film (the sound and the video for these clips were separated). the executable of the application, a Director projector file (.prj). The folder of the application also contains a number of libraries, some of which are necessary to display the work (.dir), Xtras, and Java class (.class). The first exhibition of Mondophrenetic™ was held from September 8 until October 29, 2000 in Brussels. The exhibition was part of the bruxelles/brussel 2000 events.10 The last exhibition took place in Antwerp from December 20, 2003 until February 29 2004. In total, Mondophrenetic™ was shown on seven different occasions. The documentation of the installation retained by the artists is for the most part digitised. This documentation contains pictures of the work when it was installed during the different exhibitions and also press reviews of exhibitions, emails, and plans for the exhibition space and the projection screen. All seven exhibitions of Mondophrenetic™ were photographed by the artists, but not for the purpose of preserving the installation. No specific and detailed photographs of the components of the equipment were taken. They are views of the installation taken from various angles in the exhibition spaces. While these pictures were not taken for preservation purposes, they give a good idea of the modifications that occurred each time the work was installed. Pieter Van Bogaert, De chimerische stad – 2 ou 3 choses que je sais de la ville, AS/Andere Sinema N° 157, 1-3/2001 (p. 68-75). The email correspondence concerning Mondophrenetic™ kept by Rony Vissers goes back to 2002. These emails comprise exchanges between the artists on topics such as the website, the preparation of the exhibitions in Rotterdam and Antwerp, the publication of an exhibition catalogue, the replacement of floppy disks by CD-ROMs for the exhibition in Rotterdam or the use of one room instead of two to show the work. These emails also contain technical information on equipment used, and provide further insight on how modifications of the installation were discussed. The artists ask themselves questions such as "Should we update the content if we update the floppies?" etc. The documentation in its actual state is stored on hard drives, sometimes with the work itself, in various formats, and without any real, consistent structure. A complete inventory of the available digital and analogue documents retained by the three artists should be the first step. It should be gathered, copied or digitised, organised and named consistently. All digital files should be checked to find out whether they are still readable and in what format they are stored. When possible, copying and transcoding to sustainable digital formats of all files should be done to ensure their long-term readability and availability. The website (www.mondophrenetic) created alongside the project was intended to work as a communication tool for curators, exhibition venues, visitors, the press, etc. It was made by Stefaan Van Ruyssen. The website was also intended to be an extension of the exhibition venue. It allowed the exhibition visitor and others to download the screensavers also available in the exhibition space on floppy disks (or CD-ROMs in Rotterdam). This section describes the structure and general content of the Mondophrenetic™ website. 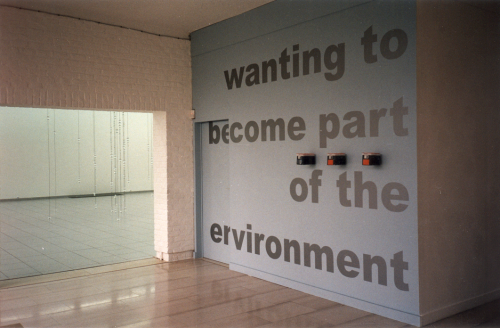 1.0/ index.html: This monochrome blue page contains an animated GIF image with two pieces of text “wanting to become part of the environment” and '”a thing among other things”. These two pieces of text are displayed one after the other, continuously appearing and disappearing, fading into the blue coloured background of the page. 1.2/ mondotext.htm: This page contains a statement of the artists about Mondophrenetic™. The text entitled Slightly Bemused by This Lack of Orientation gives details and explanations about the concept, content, history and inspirations of the work. 1.3/ usersman.htm: This page, entitled User's Manual, is a description of the different elements of the work and a guide on how the artists would like the visitors to experience the work. 1.4/ wrapped.htm: This page gives information about the book called _wrapped_ published by the Centro Galego de Arte Contemporánea on the occasion of the exhibition in Santiago de Compostela, Spain. 1.5/ exhibitions.htm: This page allows the visitors to go to three subpages (pastex.htm, currentex.htm, upcomingex.htm). On these pages, the visitor could acquire information on the past, current and upcoming exhibitions of Mondophrenetic™. This section wasn't updated after the EXPERIENCE group exhibition at the Foto Biënnale in Rotterdam in 2003. The last exhibition that took place at the M HKA in Antwerp is therefore not mentioned. 1.5.2/ currentex.htm: This section provides information on on-going exhibitions. 1.5.3/ pastex.htm: This page lists all past exhibitions of Mondophrenetic™, Wanting To Become Part Of The Environment and Slightly Bemused by this Lack of Orientation. Each city name where an exhibition took place is a link that opens a pop-up page. 1.5.3.1/ On these pop-up pages you can see four pictures of each exhibitions as well as information about the location and date of the exhibition. 1.6/ screensavers.htm: This page allows the visitor to download the three different screensavers for Mac and for PCs. 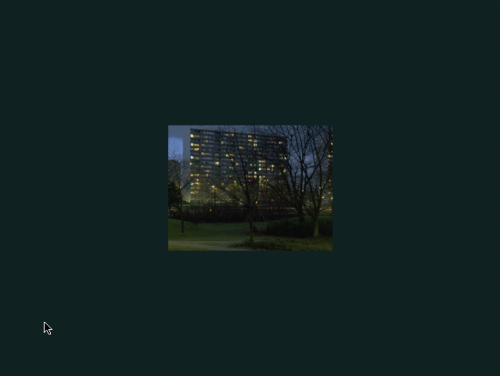 1.7/ 37th.htm: This page provides information on the CD 37th Floor Sunset that was released by David Toop with the music composed for Mondophrenetic™. 1.8/ bio.htm: On this page you can find biographical information about all artists and collaborators as well as organisations that supported the production of Mondophrenetic™. 1.9/ pressphoto.htm: This page provides access to pictures of Mondophrenetic™ that could be used for press purposes. It also lists the copyright requirements for use of the pictures. 1.10/ rider.htm: This page is the technical rider mentioned earlier in the text that gave instructions on how to install the work and what hardware was required. This page was meant to inform galleries and museums of the minimal requirements to show Mondophrenetic™. 1.11/ links.htm: This page provides links to several partners. the carrier (and availability) of the screensavers. In their technical rider the artists wrote that they prefer to show the installation in two adjacent / connected rooms. However, throughout the seven exhibitions there were some deviations from this guideline. In CGAG in Santiago de Compostela a third space with the soundtrack of the installation, coloured lights and circular rubber foam seating elements complemented the two other exhibition rooms as a kind of listeners' cabinet. "[…]as we had a lot more space, we came up with the idea of making an extension, a place where one could really immerse oneself in the sound." (Interview with Els Opsomer, Brussels, September 5 2011). "Els Opsomer: No, it was not a compromise. I believe that a work of art has to be so strong that it retains its meaning even when another version is made, and that visitors can have a taste of it no matter whether they stay a long or a very short time. Encountering a work of art is an experience. That is also why I put a lot of emphasis on the organic side of this installation, on its staging and its design, and also on how you look at it. This is very important. [...] I think that the meaning and the idea of this work are strong enough be adapted to different places." Els Opsomer: Yes. In Antwerp, it was also installed at the entrance of the exhibition space. When you're on a journey, the point that you are at in this journey has a kind of influence on the perception of the work. As an artist participating in a group exhibition, you anchor your work in a broader discourse because it becomes part of another story. In a solo exhibition, like the one in Santiago de Compostela, the whole exhibition space was ours. The visitors arrived in our place. In a group exhibition with many different works, a spectator is always permeated by what he/she saw before and after. In Antwerp, for example, our spot was at the entrance of the exhibition. It wasn't a bad place." (Interview with Els Opsomer, Brussels, September 5 2011). "I don’t consider the number of exhibition rooms in itself as a compromise. The number of rooms in itself is not very important, but the experience of the exhibition visitor is. Personally, I don’t consider the Antwerp version the most successful one. Although I like the idea of exhibiting the work in an open way together with works of other artists, I feel at the same time that something was lost in the Antwerp version. The immersive effect was less strong for me because of the fact that the exhibition space with the projection was not as dark and the sound often not as loud. This made the projection less cinematic. A thin line was crossed. It became a bit too ‘ambient’ and the work got lost in the environment. 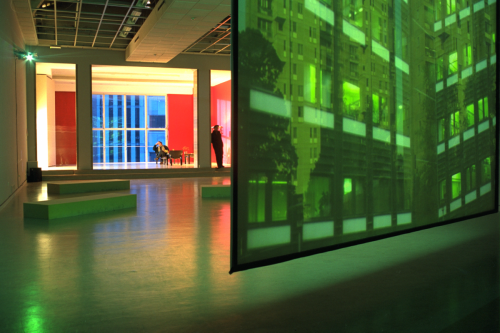 In the other exhibitions the immersive effect in the projection space was more powerful. The visitor got sucked into the image flow because of the cinematic effect of the projected images and the sound. I noticed that for many exhibition visitors in Antwerp Mondophrenetic™ became a space that one just walked through to see the other works, not a place in which one might sit down and take one's time to experience the different aspects of our work. In this exhibition the visitors also had to divide their time amongst many different works. The immersive effect was also weaker because of the fact that the monitor and mouse were built into a wall, a bit like a cash machine. As a result people spent less time looking at the monitor while clicking and dragging the mouse because they had to stand. In other group exhibitions, like those in Dortmund or Rotterdam, my experience of Mondophrenetic™ was stronger. However, I have to admit that in these exhibitions our work, like some by other artists in the exhibition, became more like an isolated island. The furniture used for the two spaces was different in almost every Mondophrenetic™ exhibition. For the first two (in Brussels and Hasselt), the artists provided the furniture themselves, while local exhibition organisers provided the furniture for the others, always based on instructions given by the artists. For them, the furniture should always in some way reflect the 20th century utopia of a 'new' world. They suggested using design furniture, often in a 60-70' style, mass-produced, functional and made of modern materials (synthetic, chrome, glass, …). Except for the exhibition in Brussels and Hasselt, the furniture was often dependent on local availability. 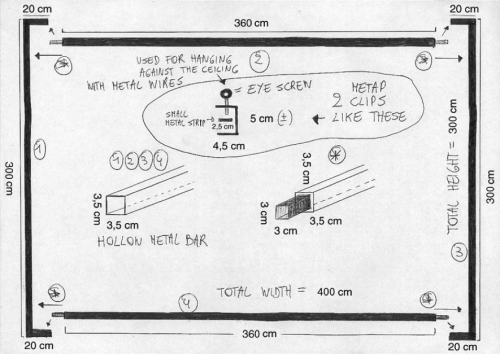 For the table on which the computer monitor was installed, the artists gave instructions with references to IKEA products. Mid 2012 the VIKA CURRY table legs were still available, but not the BRA tabletop. The original table top still exists, as it has been kept by Rony Vissers. For the display of the soundtrack CDs and the _WRAPPED_ publication in the computer space, the artists suggested using a glass cupboard KEWLOX 62 x 32 x 35 (height) cm, with a glass shelf in the middle. Mid 2012 this glass cupboard is still in the possession of Rony Vissers. For the seating elements in the projection space, rubber foam pieces were used except for the exhibition in Antwerp in which IKEA furniture was used. The decision about their colour and shape (rectangular or circular) was dependent on the size of the exhibition space and the local availability of the material. The only pieces of equipment always visible in Mondophrenetic™ were the computer monitor, the computer mouse, and the sound speakers. The computer itself was visible in some exhibitions when it was just placed under the table (sometimes under a box through which you could see the computer) or hidden when placed in another room. The projector and the speakers in the second room were also visible, but they had no sculptural presence in the room, their role was clearly only functional. The equipment was always provided by the gallery or the museum where Mondophrenetic™ was shown and chosen following the instructions of the technical rider and the artists. 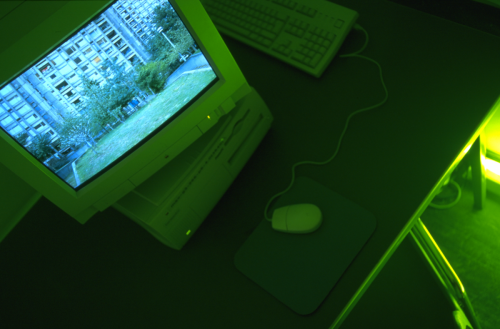 Between 2000 and 2004, Mondophrenetic™ was shown with four different computer monitors. They were always different generations of 17" Apple Studio Display monitors, except for the last exhibition at M HKA in Antwerp where (based on the photographs) the work was shown with a 17.4" Formac Gallery 1740 Oxygen (LCD display - TFT). According to the pictures taken of Mondophrenetic™ once installed, the computer mice used were hard to identify. After some research it appears that the Apple USB mouse commonly called "hockey puck" were used until the exhibition in Dortmund. What made them hard to identify from the pictures was the fact that each time an iCatch shell was added to the mouse. 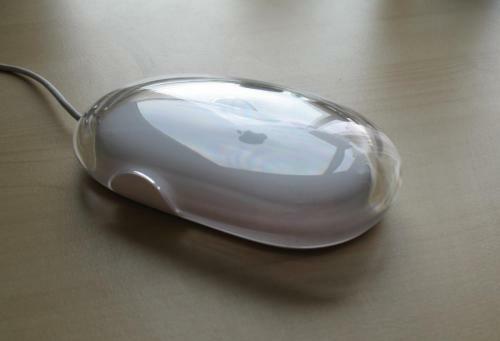 The iCatch device was developed by MacSense Connectivity Inc. to optimise the widely considered clumsy round design of the Apple Mouse. While these plastic shells made the mouse bigger they retained the design of the Apple USB Mouse as they too were translucent and came in different colours matching the different ones of the Apple iMac computers. Based on the pictures, the iCatch transparent (frost-white) and the iCatch blueberry22 were the two models used in Mondopohrenetic™. Later, for the exhibitions in Karlsruhe, Rotterdam and Antwerp either black or white (only in Antwerp) Apple Pro mouse models were used. With their transparent or translucent aspect, the mice always matched the design of the monitors. 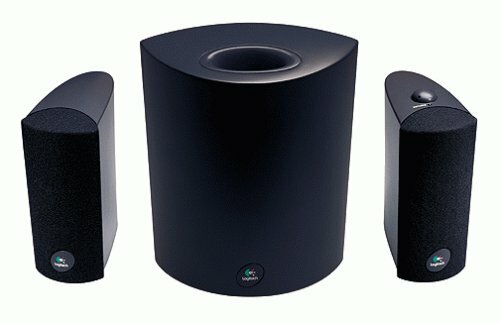 The two sound speakers with a separate sub woofer for the computer room had to be in a similar colour to the monitor. For the first three exhibitions the artists used a set of Logitech Soundman speakers with a separate sub woofer as specified in the Technical Rider. Mid 2012 these sound speakers and sub woofer are still in the possession of Rony Vissers. The exact model of sound speakers used for the other exhibitions wasn't documented. On two different occasions, new images were added to the media assets folders of the application: in Santiago de Compostela and in Hasselt. For this purpose, folders had been created from the start by the developer Andreas Kratky. The original idea was to add pictures of local surroundings of the exhibition space so that visitors could see places in the 'slideshows' that looked familiar to them. For instance, the images added to the exhibitions in Santiago de Compostela were mainly photographs taken in surrounding cities like Vigo, La Coruña and Ferol. New images weren’t systematically added for each exhibition. Neither Rony Vissers nor Els Opsomer remember when they stopped adding pictures to the folders. Emanuel Lorrain: Did you add new pictures to all the exhibitions? Els Opsomer: Yes. Maybe we added fewer photos in Karlsruhe, but I think there were some pictures added. Many photos were taken in Germany. We had ones of Rotterdam, Santiago de Compostela, Hasselt and Brussels. Anyway, some pictures of Rotterdam that I had taken in the past were added to the work, but not a lot. We had travelled in advance to take photos in Santiago de Compostela. In Hasselt we added less pictures than in Santiago de Compostela, because there aren't a lot of ‘new’ buildings there. Anyway, we always inserted the environment of the exhibition in the work. This was not meant as an illustration of the places themselves, but to give a kind of ‘sense’ or ‘flair’ of the country where the work was shown. It wasn't very mathematically composed; you have to see Mondophrenetic™ more like music." (Interview with Els Opsomer, Brussels, September 5 2011). "Our goal was to add photographs that were taken in the environment in which the work was shown. This was a nice idea that was rooted in our way of playing with the notions of the ‘familiar’ and the ‘unfamiliar’, with the ‘here’ and ‘elsewhere’. But soon it also became clear that this was an idea that was difficult to realise for every exhibition. In some cities where the work was shown it was difficult to photograph images that could fit into the flow of already existing ones. For instance in Santiago de Compostela we mainly used images that were shot in the neighbouring cities of Ferol, La Coruna and Vigo instead of Santiago de Compostela itself. Taking the photographs also required spending time in the cities some weeks or months in advance of the exhibition, which was not always possible. Adding photographs probably also became more difficult because of the fact that the collaboration between Els, Herman and myself became difficult. For the last exhibition in Antwerp no additional photographs were taken. There were already photographs of locations in Antwerp in the first version. I remember that I took photographs in Rotterdam, but I don’t think that they were discussed and used in the work. They are still somewhere on one of my hard disks. I didn’t take photographs in Dortmund or Karlsruhe, and don’t know whether Els did. There were a lot of ‘German’ photographs in Mondophrenetic™ in the first version, so maybe there was no real need to add extra pictures. I took some photographs in Hasselt. I remember that is was difficult to find locations in Hasselt that fitted the purpose. One of the photographs taken in Hasselt is used on the cover of Wrapped, but I can’t remember whether the photographs were introduced in the application itself. "I wouldn’t touch the statistics, contrary to the floppy disks they keep their functionality because they are often about the future." "Do you consider it important to update the data screens? We can do that with the help of annual fact books (I think), but does Andreas need to get involved for that or not?" "I can adapt the text screens if everyone wants to change them." "Maybe you reinforce the retro-futurism that is hidden in the diary text and photographs by updating the statistics. If the statistics are not correct / up-to-date, the whole work is no longer accurate in my opinion. Essentially this reservation does not differ from your and my (currently smaller) reservation regarding the floppy disks; the difference is that – regardless of our opinion – the lack of floppy disks will oblige us one day to update them, if there is ever another exhibition." "In my opinion we better keep Mondophrentic™ as a snapshot of its year of production. If the floppy disks need to be replaced by CD-ROMs for technical reasons, of course we need to conceptualise a nice packaging." A significant change happened when Mondophrenetic™ was shown as part of the EXPERIENCE group show in Rotterdam in 2003. For this exhibition, CD-ROMs replaced the floppy disks as carriers of the screensavers in the first room. The artists made this modification because the computers that were available on the market at that moment were no longer necessarily equipped with floppy disk drivers. For the artists the floppy disk was a carrier to distribute the screensavers, and this function was essential. The use of floppy disks made it possible for the audience to take a part of the Mondophrenetic™ installation home and the artwork could continue to live on beyond the exhibition context as screen savers on their personal computers. Distributing unusable obsolete carriers didn’t make any sense for the artists, which is why the floppy disks were replaced by CD-ROMs in Rotterdam. It was important that the carrier of the screensaver was not completely obsolete yet, but only in the process of becoming so.24 The appearance and technological historicity of Mondophrenetic™ were changed at this point. These changes were only made to retain both a part of the meaning and a functionality of the project. 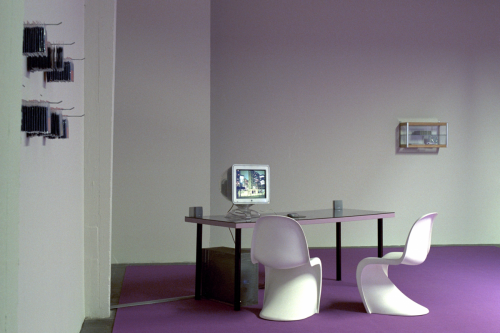 During the exhibition at M HKA in Antwerp in 2004, the installation did not include any floppy disks or CD-ROMs. According to Rony Vissers, the main reasons for this were that the exhibition budget was insufficient and there was a lack of time. "Their was no budget and the context of the exhibtion ‘an update from after documenta X which was a large group exhibition’ meant it was not appropriate to add these gadgets. Instead our work was installed next to the main entrance and functioned as a kind of ouverture and passage of the whole transition they wanted to focus on with this exhibtion. For it, we emphasized our content through the set design and the positioning within the ‘parcours’. It gave it the right context which made mondophrenetic an important viewing experience. In the other cases which were more or less solo exhibtions or with more area available for the work, the spaces fonctioned almost like ‘an appartment’ or world on itself. Moving from one space to another added to the whole expericence of the work. There it was more important to take something of this ‘world’ back home." (Els Opsomer, January 7, 2013). During its exhibition life, Mondophrenetic™ was shown three times with a LCD flat screen: in Karlsruhe, Rotterdam and Antwerp. This choice was made even though CRT monitors were still available at the time. The artists always wanted to use the latest model of monitor available at the time of the exhibition. Since 2004 not only the design of apple monitors has changed, but also the 4:3 aspect ratio, which has been replaced by the 16:9 aspect ratio. Most of the images in Mondophrenetic™ have a 1055 x 800 pixels resolution and were intended to be displayed full screen on a computer monitor with a 4:3 aspect ratio. Rony Vissers explained that for the artists it was important that the images fill the entire computer screen. To achieve this, the images were not cropped but squeezed. An image with a ratio of 1200 x 800 became one of 1055 x 800, just by changing its aspect ratio. These original images had been taken on 35mm film, an analogue photographic format that uses a 3:2 aspect ratio. Without this modification, the use of a 'letterbox' display mode would have been necessary at the time and the artists didn't want to have two black bars at the top and the bottom of the screen. If screens with an aspect ratio closer to 3:2 had existed in 1999-2000, Rony Vissers thinks that they would have probably used them instead of the 4:3 screens. However, to adapt the aspect ratio of the images to the current wider screens, images would have to be stretched. The 'compression' of the image width is now part of the history of the work and witnesses a technological constraint that the artists had to face. Touching the original picture material would mean a rather major modification. On the other hand, showing the picture in a 'pillar-box' mode with two bars on the side would go against the artists initial intent to have a full screen display of the images. Moreover the resolution of the current images is too low to change the width again. The computer wasn't an essential sculptural part of the installation and was hidden from the visitor most of the time. As a result; it is impossible to identify from the exhibition pictures the exact type of computer that was used each time. The only thing that is sure is that they were computers running on an OS9 system. However not just any Apple computer from the time should be used to show the work, as another issue is their processing speed. During the latest exhibition(s), the artists noticed that the running speed of the application increased when newer and more powerful computers were used. Emanuel Lorrain: Rony Vissers told me that you had noticed some changes in the speed of the program. Was it during the last exhibition in Antwerp that you noticed such changes because of the faster processor? Els Opsomer: No, it was already the case earlier on since Apple released a more powerful computer every year… In Karlsruhe the application already ran faster. (Interview with Els Opsomer, Brussels, September 5 2011). "I used a combination of time control methods. The general timing control works with timers and is performance independent. Actions such as image loading and display that add to the timed intervals have accelerated significantly compared to 2000 and might therefore speed up the entire experience. Loading and decompression time for panoramas is also much faster compared to the installation in 2000. In the general application behaviour I did not notice significant speed differences, but I do not have access to a direct comparison with the old version." (Email exchanges with Andreas Kratky, 2012). After the transition from OS9 to OSX Apple provided the Classic Environment application until the OSX version 10.4. The Classic Environment allowed users to run OS 9 programs on the new OSX operating system. When Apple stopped using PowerPC processors in favour of Intel processors, Classic wasn't supported anymore. For this reason, using a newly produced Apple computer would not allow one to run the original application of Mondophrenetic™. 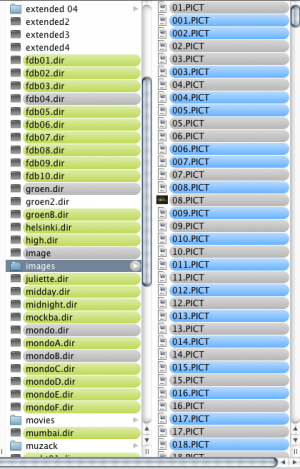 All the original Director files, media files, plug-ins, Xtras, etc. needed for the functionality of the application are still stored by the artists. Until the arrival of the Intel processors in Apple computers and up to version 10.4 of OS X, it was still possible to launch Mondophrenetic ™ in the Classic Environment. It allowed one to use an OS 9 application on a Power PC computer running an OS X system. Since OS 9 was replaced by the OS X system in 2001, and Apple discontinued the Classic environment from the 10.5 version of OS X (Leopard) in 200725, no other Apple solutions for OS 9 applications were developed. While all Mondophrenetic™ files still exist, they are not readable anymore. Except for the working files containing the source code, the screensavers created for Mondophrenetic™ have also been stored, but neither the Windows nor Mac versions work on current operating systems. The website www.mondophrenetic.com went offline during the summer of 2004, after the last exhibition at M HKA in Antwerp. The artists also stopped paying for the registration of the domain name 'mondophrenetic.com' which led to someone else taking over the registration and visitors being redirected to different pages of 'parked domains'. In June 2012, the domain name 'mondophrenetic.com' is once again available for registration. The artists ceased updating the website after the exhibition that took place in Rotterdam from March 14 – April 21, 2003. As explained earlier, the website was entirely static, using web standards, so apart from some external URL links pointing to pages that are no longer online, everything still works. Although the downloadable screensavers can't be installed on today's computers anymore, the download functions on the website are still operational. The files comprising the website still exist as a copy and are kept by Rony Vissers. For the purpose of this case study the website is visible at the address http://mondophrenetic.scart.be. Mondophrnenetic™ was created for a specific operating system and for specific hardware. While the 'data' - the set of files constituting the application of Mondophrenetic™ - is still available and complete, they still need to be preserved and become accessible again. As a work dating from the beginning of 2000, Mondophrenetic™ is witness to a certain technological era as well as a certain type of interactive artwork. The use of Director software to create the application plays a big role in that anchorage, being such a popular and relatively easy tool to use at the time even for people with no IT background. Artists often used it to create CD-ROMs and web applications, artistic installations and performances. In this sense, Mondophrenetic™ is a very good example of how Director was used for interactive installations in relation to today when other tools like Pure Data and Max/MSP are more commonly used. However, although Director is an important historical fact about Mondophrenetic™, it was - contrary to the equipment - never a visible element of the installation. The first question concerning Mondophrenetic™, is how important the hardware is for the integrity of the work. The most problematic elements that constitute Mondophrenetic™'s historical anchorage in a particular technological context are the visible hardware used in the installation, i.e., the monitor, the mouse, the floppies and the set of speakers. The importance of the equipment is not easily determined as the work changed several times from 2000 to 2004 with the installation using different models of monitors and mice. "The visible equipment was always very limited; there was just a monitor and a mouse. The exhibition visitor never saw a lot of the other equipment." (Interview with Els Opsomer, Brussels, September 5 2011). As already mentioned, one reason for this change of equipment is that the artists always wanted to use the latest model of monitor for each exhibition. "Another motivation was that in the text there were references to gagets and special objects that had a flavor of being in vogue and so the equipment followed this kind of spirit. And in the philosophy that modophrenetic was a sum of different experiences it meant that the equipment had almost a kind of organic follow up in relation to the space in which we exhibited. (Els Opsomer, January 7, 2013). With all the variations that the work experienced, defining its boundaries is not an easy task. If one considers that the original version of the work was between 2000 and 2004, which should be defined as being the historical and reference period of Mondophrenetic™, showing a "historical" version of Mondophrenetic™ would mean using equipment from that period. Keeping such version would therefore require storing and maintaining obsolete hardware. Moreover preserving the work long term would mean collecting Power Machintosh computers, different kinds of Apple studio Display monitors and Apple mice from that period and storing them in proper conditions. While collecting equipment would be important for maintaining the sculptural aspect of Mondophrenetic™, it would also be important to keep track of the original behaviour of the application, and especially its speed. 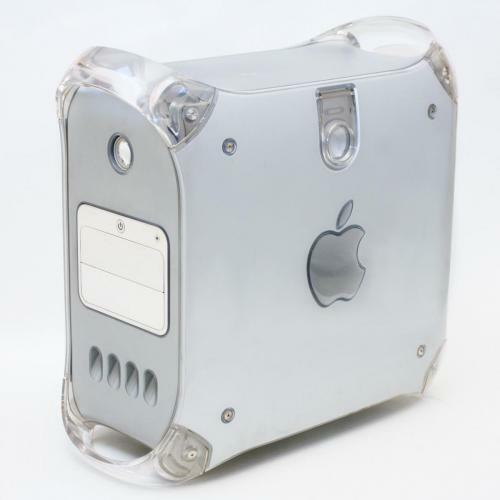 It shouldn't be the earliest Powermac G4 model, but at least the one indicated in the technical rider by the artists, i.e., an Apple Macintosh Powermac G4 with a 450Mhz processor and a minimum 256 MB of RAM and a 20GB hard drive. The computer shouldn't be one of the latest models either as the application started to run faster when more powerful processors were used in the latest exhibitions. To find out from which model the work starts to run faster, and limit the equipment to certain evolutions of the Powermac G4, one would have to run the work on different generations of computers and compare the timing of the application to see if any changes were visible. Such comparison work would be hard to achieve, as it would require having different Powermac G4. The simplest and safest solution is probably to stay as close as possible to the hardware specifications of the technical rider. However, since Mondophrenetic™ is not part of any public or private collection, it would be difficult to recommend stockpiling equipment at this moment in time. If the work was sold or donated in the future, collecting enough equipment might be a possible way of preserving it. Museums have both the storage space and sometimes the budget to buy spare equipment. "The easiest way would be to have the original equipment with everything that is needed for the work, instead of having to reprogram it." (Interview with Els Opsomer, Brussels, September 5, 2011). While collecting and storing spare equipment might appear to be the easiest strategy to preserve this work, there will always be a moment when it will lead to a dead end. At a certain point the equipment will be defected beyond repair and finding new spare devices or parts will no longer be possible. Building alternate strategies to stockpile old equipment would be complementary to ensure that the work is at least partly accessible in the future. "The technical rider is very accurate. If you follow it you will still have a version: the initial one. Everything else is "frivolous". It's similar to performance work. It is the same problem. There is also a kind of "smell" that remains… But I do not like the fact of not letting go. Of course, you must let go. Maybe it will be harder to do so, but you should keep trying... I think there is something that is not "palpable" in Mondophrenetic™'s approach[…] I think that the equipment is important but in the end you go home with the images and sound and experience you had and this should have made you think about your surrounding world and how as an individual you deal with it. The individual and collective experience are also important. As an individual you are in front of a computer which is always difficult to share, so this experience is directly addressed to you as a viewer, whereas in the projection room you have a physical experience by feeling the subwoofer and being in front of a big screen where you can decide the distance you are from it. And probably you will not screen it alone but with other viewers." (Interview with Els Opsomer, Brussels, January 7 2013). "I think that Mondophrenetic's content goes beyond the question of the equipment. The technology was there, but the content was far more important. For me, Mondophrenetic™ differs, for instance, from the early video art that played a lot with what could be done with technology; This approach has never really interested me. It is not something that I'm attached to. It might be interesting for someone who is very interested in technology, but I care less about it." (Interview with Els Opsomer, Brussels, September 5, 2011). "The main thing for me is the experience of the viewer or exhibition visitor in its different aspects. Technology is only a means of creating this experience. The most visible equipment of Mondophrenetic™ was the monitor and the computer mouse. This equipment was updated between 2000 and 2004. It would make sense to update it for possible future exhibitions, but it's not an isolated question. It is also linked to the question about updating the image and text material. Especially nowadays, things that do not adapt to the new technological conditions, risk disappearing. This is also true for Mondophrenetic™. Even if you try to preserve the original equipment, it will stop functioning at some point. You can decide to stick to the original equipment and accept that it will become impossible to show the work at some point or you can opt for an adaption in order to go on showing the work. If the work is not shown, it disappears. The fact that the work has not been shown publicly since 2004 and that there was further interest in the work, makes me feel that it is slowly dying in a kind of way. I would consider a new exhibition, especially one with new display technology, as a kind of ‘resurrection’. It would feel strange, but I’m not against it. I’m also not against preserving a historical version. I can imagine that it can make sense to show a historical version in some contexts. Here again, it would feel strange. An old-fashioned monitor and mouse might even distract attention and define the experience of current and future audiences as much as a touchscreen does with content from 2000. This technological issue is another aspect of the experience of the passing of time that is part of the work. It will become even more prominent as the piece gets older. It is a matter of finding an interesting and consistent way of dealing with it. There are probably two ways to do this: to preserve a historical version of the work or to slowly update it and replace components when things become obsolete and threaten its life. In the first option you will experience a kind of time friction because you will clearly feel there's a difference between the time in which the work was made and the time in which it's seen. But this is an option which you have to accept will expire sooner or later. In the second option you mix elements from different periods and this also creates a friction. Both options are possible, and maybe should be explored at the same time as long as possible. One functions as a historical reference for the other. However, I do not mean that both options should be exhibited together. When I first started thinking about this case study, I thought that a frozen, historical version was the best and only preservation option, mainly because there have been no exhibitions since 2004. But the more I thought about it, the more I became interested in this aspect of the passing of time. Sculptures and paintings also change through time, mainly due to environmental conditions. Artworks are also restored over time. As long as the viewer or exhibition visitor acquires the correct information and is not told that the possible future exhibited versions were not created in 2000, a lot is possible. This approach also corresponds to the original idea of adapting the work to the local exhibition circumstances and technological evolution. Preserving a frozen, historical version might help to maintain the historical reference. But then we will also have to discuss what is exactly the frozen, historical version? Is it, for instance, the 2000 version in Brussels, the 2003 version in Rotterdam or both? When the original hardware is no longer available, other solutions could be explored. Due to the progressive unavailability of the original equipment, using current equipment could be a strategy to consider. Replacing the original monitor and mouse with current ones would somehow be coherent with the decision that the artist always made for each exhibition to use the latest hardware available. In the same way, the floppy disks and the CD-ROMs used at the time could be replaced by, for instance, a USB hub, a 2D Code readable by smartphones or by whatever one would consider to be today's equivalent for floppy disks and CD-ROMs. For Els Opsomer, updating the display equipment wouldn't be a problem as it wasn't initially when LCD screens were used instead of CRT monitors. Els Opsomer even suggests that using a touchscreen instead of a monitor and a mouse could be an option. "Emanuel Lorrain: Isn't the appearance of the monitor and the mouse an important aspect? Els Opsomer: No, because we always chose the latest model of the computer mouse or monitor. Maybe we should even show Mondophrenetic™ with a "touchscreen" today, I don't know..."
(Interview with Els Opsomer, Brussels, September 5, 2011). But by doing so, the link to the techno-cultural historicity of the work would be lost and a big part of Mondophrenetic™'s authenticity and original look would be gone. Moreover, such an update would have to be repeated at some point and eventually the link to the original Mondophrenetic™ would disappear. "Emanuel Lorrain: You used very recognisable Apple devices with a neo-futuristic design, a little like a "space shuttle" with transparent plastics. For me this equipment is very visibly present in the installation. Els Opsomer: If you compare a screen of today with the ones we used in the past, the screens have not changed that much. Emanuel Lorrain: Indeed, Apple screens always have a particular design, but there are changes. Their aspect ratio changed for instance from 4:3 to 16:9. If you showed the work with news screens, you would need black stripes on the sides or would have to "stretch" the image content. Would that be an acceptable change for you? Is it important that the images are shown in full-screen mode? Els Opsomer: You can change it a bit. You can adjust your screen. Emanuel Lorrain: By having black bars on the sides? Els Opsomer: Yes." (Interview with Els Opsomer, Brussels, September 5, 2011). "The question of the aspect ratio is an interesting one. I’m afraid that showing the work pillarboxed on a 16:9 monitor would substantially change its perception. Then it would become an image running on a screen, while in the past the image and the screen were more intertwined as one. The result would be similar to watching an old film pillarboxed on a 16:9 screen. I would prefer to try and find a way of making the images run on the monitor in a similar way to screensavers or to iTunes Visualizer. That is how they were intended to be shown. I’ve never seen screensavers or iTunes Visualizer only cover the centre of the screen. In fact that is not completely true; I just remember that at least two of the Mondophrenetic™ screensavers have a combination of letterboxing and pillarboxing. While the obsolescence has an impact on the look and feel of the work, it also has an impact on the readability of the application. Currently the only way to run the work without using a PowerPc based Mac running on a Mac OS 9 operating system, or the Classic environment part of the OS X system until version 10.4.11 would be to use another emulator. To run the application on a current computer would require an emulator capable of running an OS 9 system on a recent operating system such as OS X 10.7 or Windows 7. If such an emulator did exist, showing the work again would not require any modification of the original application made by Andreas Kratky. That said, the only solution currently available to emulate OS 9 on a more modern system is the application named SheepShaver. SheepShaver is a free and open source software that can emulate Apple Mac OS systems from version 7.5.2 to version 9.0.4 on newer operating systems such as OS X 10.7. To use SheepShaver, a copy of the operating system is needed, as well as a ROM image extracted from a PowerMac computer. Apple has never released the rights on its old computer ROMs and as they are protected, using such an emulator would also mean being in a grey legal zone. However, tests made with SheepShaver showed that Mondophrenetic™ crashed several times and that the sound was of poor quality. While some problems could be tweaked, the biggest issue is that Mondophrenetic™ uses two capture cards in order to display the work on both the computer monitor and the projection screen. At the present time, SheepShaver isn't able to work with two capture cards. The other issue is that SheepShaver is a software programme that is only upgraded when the community of volunteer developers has the desire and the time to develop it further. Since the main developer behind SheepShaver is no longer working on it, future developments of SheepShaver can't really be ensured unless the SheepShaver project finds financial support at some point. Therefore, SheepShaver wouldn't be sufficient to ensure the long-term accessibility and preservation of Mondophrenetic™. The second possible strategy to run Mondophrenetic™ on newer computers would be to migrate the existing application to a more recent version of Director in order to create an executable that could run on current operating systems. The latest version of Director, Adobe Director 11.5.8 was released on September 6, 2010. Creating a full working version running on today's computers would require more than just opening the file with the current Director and exporting it again. It would be necessary to adjust the code manually in this migration process due to the evolution of the Director software itself. While Andreas Kratky did successfully export the original application to a working executable for current systems, this migration would have to be done again at some point when the hardware and operating systems evolve. Indeed, as any migration strategy will have to be done again at some point, one will always be dependent on Adobe's willing to continue supporting the development of its software. "Hardware virtualization or platform virtualization refers to the creation of a virtual machine that acts like a real computer with an operating system. Software executed on these virtual machines is separated from the underlying hardware resources. For example, a computer that is running Microsoft Windows may host a virtual machine that looks like a computer with Ubuntu Linux operating system; Ubuntu-based software can be run on the virtual machine." Having a version of Mondophrenetic™ running in a virtual machine would mean not actually touching the work anymore, but instead moving the entire virtual machine from one computer to another. Unfortunately, no virtualization tools exist for old Mac systems and virtualization in general is more developed for Windows than Apple computers. Considering the virtualization solutions currently available, a version of the Mondophrenetic™ Director application for a Windows platform could be made and implemented in VMware for instance on a new computer. To keep it as close as possible to the original application this could be done with the MX 2004 version of Director, the first to allow the creation of projectors for both Macs and PCs. A more radical solution would be to remake the work with another technology. One would first have to find out which software or language would be able to provide the same functionality as the original Director software, and also decide which technology would be the most sustainable. One could for instance choose between an open source software programme like Pure Data or a proprietary software programme like Flash or Max/MSP. Flash is a software that has a very close history with Director partly due to their common owners. Flash is also much more popular than Director as a great number of websites and web applications are made with it. Compared to Flash, the Director community is much smaller (and is still decreasing). As Flash is an extensively used format on the web, there is a good chance that Adobe will continue to develop it at least for some time. However, Flash can't be considered a sustainable solution either. Replacing one proprietary software with another would mean taking the risk of being in exactly the same situation as with Director. Moreover, the recent development of the HTML5 standard, the popularity of the JQuery library and the increasing use of touchscreen devices might very well lead to the end of Flash very soon. Several tests were made with Pure Data to see if all the features of Mondophrenetic™ could be recreated. It appeared that by using the GEM library, all the random procedures, the timing, graphics and interactivity functions of the work could be recreated. Moreover, with the exception of the Quicktime VR panoramics that would have to be remade differently in Pure Data, all the assets (images, videos, sounds) used in the original application could be used and displayed without any transcoding to other formats. Before migrating, emulating or remaking the original software components of the work, it is important to analyse and describe how they work. Documenting the source code, the structure of the application, and its behaviour is essential to proceed towards any migration, emulation or recoding of the work. As seen, when using different hardware, some parametres might change because of the enhanced speed of a computer for example. Once all algorithms and timings are known, one can start remaking the work. Without this analysis, one would have to look at the work run and note all its behaviours. As the behaviours of the work are largely based on random procedures and the chance that someone would see twice the same work is quasi inexistent, this approach towards describing the behaviour of the work might be complex. In the case of Mondophrenetic ™, Andreas Kratky already did part of the code documentation when he programmed the application. Documenting the code is important as it will give anyone reading the code later the chance to understand its logic more easily. As Andreas Kratky explained, even for him, and is he who wrote the code, it is currently hard to read without his comments. This documentation approach should be combined with strategies such as migration, emulation or recreation. Once the work is migrated, emulated, remade, etc., the new and the original version should be compared, if possible, in order to determine whether restoration is acceptable or not. Documenting the pace of the work would allow one to judge whether it is still running as it was at the time of its creation. If any migration, modification of the code, or recoding of the work is to be made, the programme should be documented and commented again as precisely as possible in order to allow future programmers and conservators to understand what was made. The artists were already aware during the production process that the floppy disks would soon become obsolete as Apple computers had already abandoned floppy drives on their new models. If Mondophrenetic™ had to be shown in its original form with the original hardware and software, including the floppy disks and the screensavers, the functional part of the floppy disks would obviously be lost. A collecting institution might collect the floppy disks for preservation purposes, but that will never change the fact that the floppy disks have become useless for the public in terms ofinstalling the screensavers onto their computer. The obsolescence of the floppy disk as carrier was already the reason why the artists decided to replace them with CD-ROMs for the exhibition in Rotterdam. But not only have floppies become obsolete today, but also the whole use of computers has evolved and a screensaver could be seen as a kind of antiquated piece of software. "Emanuel Lorrain: Should the floppy disks be kept? Els Opsomer: The floppy disk is something that the visitor took with him/her. I do not have a clear answer to this. Now you could just have a link and download a screensaver. If you really want to give something you can. If you are using the floppy it would be to make another reference, it would be more than just having part of Mondophrenetic at home. Today you would do it quite differently. All media have changed." (Interview with Els Opsomer, Brussels, September 5, 2011). "Again, the main thing for me is the experience of the viewer / visitor in its different aspects. The technology is only a means to create the experience. The problem here is how can you keep the experience or create a similar experience while the technology has changed. The floppy disks were not only physical objects, but also carriers for transporting screensavers. I liked the idea that you could actually take something from the exhibition space rather than downloading possibility, but nowadays with the different portable media around visitors would even be able to download something in the exhibition space itself. The floppy disks and later on also the CD-Rs carried the notion of obsolescence. At that time they were on the brink of obsolescence, today they are obsolete just like USB sticks and others. At the present time the use of a physical carrier just for the transport of screensavers is an out-dated idea. Also classic download links are not very interesting anymore. Today it might be more interesting perhaps to explore, for instance, the use of QR codes for mobile devices, although even that approach seems to have passed its peak with the introduction of apps. The fact that the notion of a screensaver itself has changed makes this probably even more difficult. Today computer monitors go into sleep modus to save energy (and the screen) instead of displaying a screensaver. Maybe a simple desktop image would currently be more visible than a screensaver. I’m afraid that there is no good, and especially no fixed solution for the question of the floppy disks and the screensavers. If we agree that the work should be able to adapt to the new technological environment, we should also not be afraid to give up some aspects and maybe introduce others. The slide projection on the window in Brussels was also never again used afterwards. The same goes for the exhibition space filled with sound and coloured light in Santiago de Compostela. "Shouldn’t we choose this time / from now on to use a CD-ROM instead of a floppy disk? I have the feeling that the concept of an obsolete technological object succumbs to its functionality. In other words: nobody uses floppy disks anymore and thus nobody will take one away." "It all depends on how you view the functionality of a floppy disk, as a Mac proselyte or as a PC user (still the large majority). All PCs that I see in the shops still have a floppy drive. As such, for them there is not really a functionality problem, only for the minority of Mac users but they can still be served through the website. The advantage of CD-ROMs is that many PC and Mac users have a CD drive and all the different screensaver versions (for Mac and PC) can be put on one CD-ROM." "Concerning the CD-ROMs, it may seem practical to me but to stress the “instability“ I think that it is visually better to stick to the floppy disks. This is also a matter of representation, with a reference to the apartment block. I’m fond of that. This is also to match the content because the references to technology in the text screens are likewise already out of date." "At the present time, when even PCs don’t have a floppy drive anymore, the use of floppy disks expires for all I care, because their meaning is completely changed (and probably floppy disks will no longer be produced anyway). Nowadays I have no problem with floppy disks being a useless object for the majority of Mac users, but I will have a problem when they becomes useless for the large majority of all computer users." "As an indication of the original version, I prefer floppy disks, but a delivery of ready-to-use material is the best. If it were to be CD-ROMS, we need to know the packaging and indeed accept the situation…"
Using floppy disks in the installation today would allow one to keep the original appearance of the installation as well as its historical anchorage. "Els Opsomer: I think I too would use floppy disks again in the installation, I see no reason for us to change that ..."
Emanuel Lorrain: The fact is that floppy disks do have a sculptural interest, a certain look and they recall a certain technological context, but at the same time they've lost their functionality today. Before someone could take one and bring it home as part of the installation to put on their computer. Els Opsomer: I think that after a certain time an installation roots itself in a different, contemporary period and makes a new reference. It's true that when you look at the floppy now, it refers to a certain era of time, and even if you can't use them, there are other visual aspects that remain. It becomes a kind of archive of something too. Its meaning changes, but I do not know if that implies it has no meaning anymore. I think that when you look at photos today that were taken in the fifties, something has also changed. Not only what's pictured is changed, but also the aesthetics. A movie that was new and ‘hot’ in the 1980s, is now "old fashioned" because we look at it another way. I don't think that it's just technology has this impact." Emanuel Lorrain: The difference with a photograph is that today you can only see the carrier of the screensaver and not the actual screensaver anymore. This is where the floppy disk may have lost its function. Maybe it's taken on another meaning as well. Els Opsomer: Yes, but for me it is our eyes that give this new meaning…" (Interview with Els Opsomer, Brussels, September 5 2011). Unlike the application of the installation itself, the screensavers were created to work on different types of hardware and operating systems. This was necessary to provide the installation (or website) visitors with the possibility of installing the screensavers on the computer they were using at home or at work. They were available for both Apple and Windows platforms. Neither of these two versions of the screensavers work anymore on current operating systems. "While the Director project can be ported to a current system, the screensavers do not run on a current system. I guess in order to get them working again one would have to either write a custom code or look for a new screensaver engine that works with current operating systems." (Email exchanges with Andreas Kratky, 2012). Even if using a virtual machine or an emulator could allow one to see the screensavers again one would still not be able to install them on one's computer. Updating the screensavers could be done by migrating their concept and behaviour to current computers or mobile devices, but since 2004 not only computer technology has changed but also the use of computers. If screensavers had to be migrated or remade in another format, for what type of device and system should it be? Should they still be made as screensavers for personal computers, or as applications for iPads, iPhones or other mobile devices used nowadays and would it still make sense? "I would find the presence of floppy disks in the exhibition kind of funny. However, I’m not sure whether it is still possible to produce a new series of floppy disks with screensavers. There are probably none available anymore. ... I think that the decision should be based on the context, the time and the goal of the exhibition. How crucial is it for Mondophrenetic™ that the user can take home the screensavers, i.e., a part of Mondophrenetic™ ? If it is decided that it is an essential feature of the work, then an alternative has to be found in the form of new carriers or other ways of distributing a screensaver to the audience, using smartphone, QR codes, etc. However, the notion of a screensaver itself is very much dated and related to a certain period. Is it a legitimate question to ask whether a screensaver would still be relevant in today's technological context? Els Opsomer sees the installation as an organic work that can adapt to contexts and circumstances. For her, not having the screensavers would be just another adaptation to the context. However, she still feels that the floppy disks have a strong sculptural value and could remain, despite being unusable, within the installation. "Els Opsomer: I'd prefer to have floppy disks rather than CD-ROMs, but this is more because of their visual aspect. Emanuel Lorrain: You mean that you prefer their sculptural aspect in the installation? Els Opsomer: Yes, I personally prefer the installation with the floppy disks. Although the CD-ROM and the website are also nice and still make sense." Emanuel Lorrain: In Rotterdam the floppy disks were replaced by CD-ROMs because floppy disks were already ‘obsolete’. This choice was made to preserve the functionality that the floppy disks had provided. Els Opsomer: Yes, that is true but at that time we were still busy with the project and it was constantly evolving. Today we would have to resume working on Mondophrenetic™, because the work has been dead for several years. It has died on different ‘levels’. The situation is quite different. Emanuel Lorrain: Could we say that Mondophrenetic™only existed from 2000 to 2004, because after the exhibition in Antwerp nothing happened anymore with it?. Was the exhibition in Antwerp satisfactory or where there already some compromises made for this exhibition? Els Opsomer: In this exhibition the version of Mondophrenetic™was already a kind of reference to earlier versions of Mondophrenetic™, because the exhibition was conceived as such. It aimed at giving a sort of ‘overview’ of the Belgium art scene during a certain period. I think that when you participate in a group show you're always in a kind of reference. At that time I already found that that version was a bit of a reference to earlier versions of Mondophrenetic. However, it wasn't a compromise because you always have to adapt to a specific place. Emanuel Lorrain: Rony Vissers said that there were no CD-ROMs or floppies in the exhibition in Antwerp because of budgetary restrictions. This could be seen as a kind of compromise. Els Opsomer: Indeed, there were no CD-ROMs or floppy disks. However, every exhibition has budgetary constraints that you have to adapt to. I am not sure that all decisions that are related to budgetary constraints should be considered as a compromise. I believe that a work of art is a living thing that adapts itself.” (Interview with Els Opsomer, Brussels, September 5, 2011). By allowing the visitor to download a screensaver, the website was also a way of extending the scope of the work beyond the exhibition space. To show a historical and complete version of Mondophrenetic™ the original website might have to be re-launched. From a technical point of view, the website is still fully functional and would only need to be placed on a server to be online again. The website has today become an element of its documentation. If the decision was taken to freeze the work in a state between 2000 and 2004, then should it also be freezed in its latest version? If not, several sections, such as the 'exhibitions' section, would have to be updated. The website has always been a documentation and communication tool for the artist and one could say that it should continue to have this function if the work were ever be shown again. Els Opsomer thinks that it would be good to update the website with information on future exhibitions and also complete it with the ones that were not added previously in 2004. If updated, an untouched copy of the website as it is now should be kept as an archival copy. Another question concerns the domain name. For Els Opsomer it would also be better that the mondophrenetic.com domain name is maintained to access the website if someone ever put it online again. "Els Opsomer: In my opinion the website would still have a lot of meaning for the work. Emanuel Lorrain: Is the domain name mondophrenetic.com also important? Els Opsomer: Yes, I think that it's very important." (Interview with Els Opsomer, Brussels, September 5, 2011). Today, Mondophrenetic™ only remains through its parts and components (application, floppy disks, files, …) in a non-installed form and the documentation is still in possession of the artists. Many of these parts and components are now obsolete. As the work was never acquired by a collecting institution, there is not one place in which a version of the work (with the necessary software and hardware components to re-install it) is kept for preservation. As long as the work is not part of a collection and until someone plans to show the work again, it is be very likely that the work will remainas it is now: as a combination of parts and documentation. For the purpose of this case study the possible strategies to show and preserve the work have been considered, but a legitimate question remains: whether efforts should be invested in the preservation of Mondophrenetic™ ? In relation to the other works that are part of the Obsolete Equipment project, Mondophrenetic™ isn't part of a collection. While there is a duty for a collecting institution to keep works accessible for future generations, no one is in charge of preserving Mondophrenetic™. This complex question applies for all works that are not part of collections. The acquisition phase is traditionally the moment when an artwork officially becomes cultural heritage. Although Mondophrenetic™ was not acquired by a collecting institution, it was shown several times in museums and galleries in different European countries. Although no public or private institution ever bought the work, a certain amount of public money was invested in the production of the work. It was even part of the overview exhibition ‘Once upon a time... A look at art in Belgium in the Nineties’ at the M HKA in 2004. For all these reasons Mondophrenetic™ is a work with a relative level of importance at least in terms of media art production in Flanders at the end of the 20th century and beginning of the 21th century. Els Opsomer and Herman Asselberghs have both continued to have an artistic carrier with some of their other works being acquired by art collections both in and outside of Belgium. As seen, several directions could be explored in order to show Mondophrenetic™ and preserve it for the future. However, it seems that there isn't one strategy that will ever allow one to experience the installation exactly as it was intended not so long ago. Preserving the work for the long-term will probably require the use of several strategies and not just of one. A sustainable version of Mondophrenetic™ would probably be a mix of preserved equipment, migrated and emulated parts together with a strong documentation. While the ‘technical rider’ gave a rather strict definition of the requirements to install the work, modifications have occurred and moved the ‘boundaries’ of the work several times. However, the equipment, furniture and settings used from 2000 to 2004 have now become the references that also set the limits of a historical version of the installation. Even with the same equipment, software, furniture and space, something of the original Mondophrenetic™ would still be lost. As seen with the floppy disks and the screensaver, the installation is tied to a technological context that is gone. But to some extent, obsolescence has always been a part of the work's concept and the artists were aware from the beginning that components of the installation would become obsolete very soon after completion of its production. In this sense, floppy disks of the installation did not only carry the screensavers' data, they also carried the idea of a rapid ageing of things in general in the frenetic world that the work depicts. Maybe Mondophrenetic™ itself has become just like its components: “one of those modern objects upon which we already look back with nostalgia”. 2. Like for instance dial H-I-S-T-O-R-Y (1997) by Johan Grimonprez. 4. Quote from the archived version of stclairsw.com on archive.org. 5. Quote from the archived version of score.de on archive.org. 7. The specifications for the audio files are: 16 bits; uncompressed PCM; 1 chanel; 22.05 KHz. 8. The specifications for the images are: resolution 72 ppi; dimensions 1055x800 px; ICC profile: sRGB IEC61966-2.1. color depth: 8-bit color. 9. The specifications for the videos are: dimensions: 771x350 px; image ratio: 2.2:1; frame per second: 25 fps; sub sampling format: YUV 4:2:0; bit/pixel*frame : 1.114; bit rate 7513 kbps. 10. In 2000, the city of Brussels was the European capital of culture. 11. This exhibition was organised by the artists themselves as part of the brussel/bruxelles 2000 events. 12. a. b. As part of the group exhibition ‘EXPERIENCE / Foto Biënnale Rotterdam’. 13. As part of the group exhibition ‘Once upon a time... A look at art in Belgium in the Nineties’. 14. As part of the group exhibition ‘Onzichtbare Stad / The Invisible City’. 15. As part of the group exhibition ‘3ness’. 16. An email address still used by Rony Vissers. 18. In Brussels, Hasselt and Santiago de Compostela. 20. In Karlsruhe and Rotterdam. 22. The iCatch Blueberry was only used in Santiago de Compostela. 24. In 2003 the CD as a popular data carrier was already on the brink of becoming obsolete. 25. Followed by Mac OS X 10.6 (Snow Leopard) in August 2009 and OS X 10.7 (Lion) in July 2011.